We've all lamented the lack of ambition (and science fiction) from Syfy, but now it looks like Monday's launch of Defiance is just the first step towards the channel's creative resurgence. At tonight's Upfronts, Syfy will announce tons of projects — including a lot of space-based TV shows, one of which is from the creator of The Middleman. In addition to Defiance, Syfy already has a couple other promising projects already in the works: It's filming 13 episodes of Helix, a show about scientists investigating a possible disease in the Antarctic from Battlestar Galactica's Ronald D. Moore, plus showrunner Steven Maeda and pilot writer Cameron Posandeh. And apparently, it's now greenlit the reboot of Blake's 7, with a pilot written by Joe Pokaski (Heroes) and directed by Martin Campbell (Casino Royale). Ringworld: Yes, Larry Niven's classic book series about the coolest megastructure in space could finally be getting a four-hour miniseries, according to Entertainment Weekly. EW describes this as a story about human explorers traveling to the farthest reaches of space to investigate "an alien habitat the size of one million Earths." They crashland and discover ancient civilizations, miraculous technology, and a possible salvation for Earth. Syfy considered making a Ringworld miniseries nine years ago, with a different crew. Let's hope this turns out better than Syfy's two Riverworld miniseries, and its Earthsea mini. This is being written by Michael Perry (The River, Paranormal Activity 2). And it's a co-production of MGM Television and Universal Cable Productions (UCP). Infinity: This is one of several space shows that Syfy is putting into development, but this one is notable for being the creation of Javier Grillo-Marxuach, creator of The Middleman. It's being produced by Berman/Braun and Universal Television. According to The Hollywood Reporter, this one starts out with an alien "armada" appearing near Pluto. 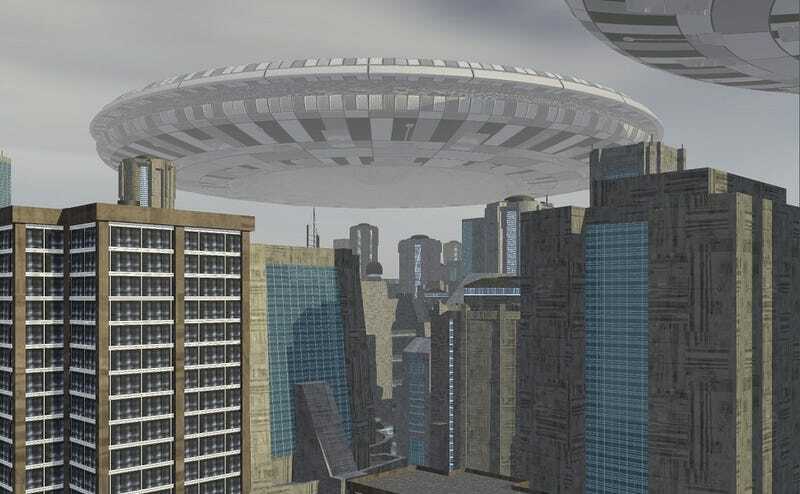 Earth sends the only interstellar ship we have, created by a billionaire industrialist out of secret alien technology we discovered in the 1960s. But after the ship engages the alien fleet, it falls into a wormhole and winds up in deep uncharted space, searching for a way home. Expect lots of Middleman-style humor and insanity in this one. Sojourn: A third spaceship show — or fourth, if you count Blake's 7. The first detective in space has to solve a murder on a starship that's on its way to colonize a new planet, and gets drawn into a "vast conspiracy" that has to do with a terrible crime that was committed when the ship was launched 50 years ago. This one comes from writer Phil Levens (Smallville) and producer Jason Blum (Paranormal Activity). Clandestine: And a fifth space show. They should just show all of these pilots over a week, and let us vote. This one comes from writers Todd Stashwick and Dennis Calero, but it's executive produced by John Shiban (X-Files, Supernatural, Torchwood). In this one, there's a clan of bandits who are attacked and "left for dead" by Coalition forces, and they're forced to take refuge inside a derelict Coalition spaceship that's just floating in deep space. Once on board, they decide to masquerade as Coalition officers while continuing their life of piracy — until they stumble on a secret about the true nature of the Coalition. This sounds very Blake's 7, actually. Gale Ann Hurd (Walking Dead) is also producing. High Moon: Another space show, albeit one closer to Earth. This one has Bryan Fuller (Pushing Daisies) as an executive producer, although the pilot is mostly written by Jim Danger Gray (also Pushing Daisies). In High Moon, Earth's nations all start establishing colonies on the Moon to exploit all the natural resources up there — and then they discover "a new form of life." Chaos breaks out "in a genuinely emotional, humorously thrilling and always unexpected fashion," according to the logline quoted at Deadline. Silver Shields: And now, a non-space-based show, which means this one has better odds of making it to television. It comes from writer Robert Hewitt Wolfe (Alphas, Star Trek: Deep Space Nine) who had the space show Defender in development this time last year. In Silver Shields, Caymer is a farm boy whose father is murdered by assassins connected to the government of the nearby city Pont Royal. So Caymer goes to the city and becomes a police officer, like his father was, and tries to solve his father's murder — in a city full of orcs and other magical creatures. We're in, just for the orcs alone. Shelter: A massive meteorite is on a collision course with Earth, so 30,000 people have to go live in an underground shelter, where things quickly descend into infighting and scheming. Meanwhile, life on the surface is not what everyone expected, and the survivors soon realize that they may have been meant for a greater purpose. This comes from writer/producers Bruce Joel Rubin (Deep Impact) and Ari Rubin. No Place: Suburbanites living in a gated community wake up and discover that the rest of the world outside their gates has vanished, in this series based on the Top Cow comic The Test by Matt Hawkins and Joshua Hale Fialkov. According to the official logline, "residents of a high-tech gated community awaken one morning to find themselves alone and cut off from the rest of reality – nothing exists beyond the community’s walls. Only one man has contact with the powers responsible for what is known as ‘The Rift,’ and he must lead his fellow residents beyond the void to discover the truth."